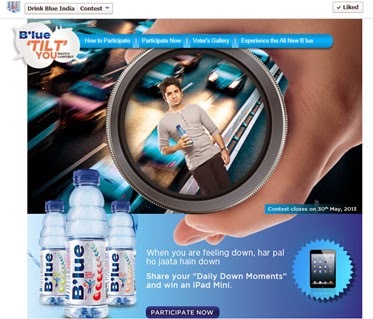 B’lue from Danone Narang Group India is a new entrant in the health, non-fizz, beverage category. With fruity flavor options like Guava, Peach, Apple and vitamin & mineral add-ins, the water-based drink claims to be a new generation restoration drink. Not sure what that means, but the brand communication is centered on the claim that the beverage uplifts your mind and body so that you are ‘At your best Hamesha’. The digital campaign for B’lue includes a Facebook brand page, Twitter presence and a website. 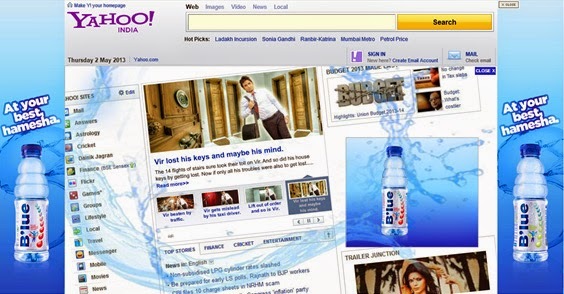 I really liked the Yahoo! India Home Page rich media execution earlier this month (screenshot below), which was an extension of the leaning Vir Das TV commercial for B’lue. The contextual content integration in the expanded banner area and striking imagery and animation were a hit and made me check out the other brand assets. The Facebook presence though doesn’t have any substance. The wall posts are predictable, the writing average and the Tilt Your Photo Contest is an execution we would pitch to brands 4 years ago. The contest premise – users need to write about their not-so-happy moments in the day, add a picture, share it on their walls and get maximum likes to win an I-pad Mini. The communication, branding and digital assets have so much potential but the final execution leaves a lot to be desired.